Ellen O’ Brien (Mother Agnes) was the youngest daughter of James O’ Brien, a Limerick merchant, who entered High Street convent in 1893 at the age of sixteen. The initial attraction of caring for poor children became a focal point of her religious life. 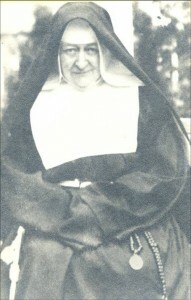 The Newry convent had already responded to requests for foundations in other parts of Ireland and Australia by the time she joined the Order. Mother Agnes, always creative in her role as Abbess of the Newry convent found new ways of helping the poor. In 1924 she began the “Little Flower Knitting Industry”. thus providing employment in the locality. A few years later a site was acquired on which the Sacred Heart Grammar School was built providing valuable educational opportunities for local girls, especially in the years following the 1947 Act which gave children free access to second level education. The convents founded in the previous century with help from Newry were essentially independent but Mother Agnes realised that there was strength in unity. In 1944 she developed her dream further by leading an amalgamation of these independent convents to form a Congregation which was then known as “The Irish Poor Clares of the Immaculate Conception”. This merger of the convents was a highly important development. By pooling resources Mother Agnes was able to respond to requests for convent schools in Ireland, England and Wales. These were often in areas which lacked Catholic schools. By establishing these new small schools she laid the educational foundation for many Catholic parish schools scattered throughout England and Scotland. She also took on the new apostolates of child care and care of the elderly. In 1960 the first sisters went to the United States to work in Catholic School system there. Mother Agnes died in February 1967 without seeing how her dream of helping the poor had extended to Central America. This mission opened in 1971 and while initially the sisters worked with the Franciscan Friars in parish ministry, for the past eight years they have been involved in education in some very poor areas of El Salvador and Guatemala. In this way they are continuing her work for the poor and vulnerable in our society.